In the Winter wonderland streets of Paris this past Monday, at the Villa Chanel, inside the enchanting Grand Palais, creative director, Karl Lagerfield showed his astounding collection for the Chanel Spring/Summer 2019 show, inspired by the 18th century skilled craftsmen, one of the designer’s favorite fashion periods. In this dreamlike setting of luscious palm trees and polished gardens, we watched embellishments of bright colors, voluptuous feathers, and delicate laces – a spectacular show where extraordinary elegance and high end chic come together. 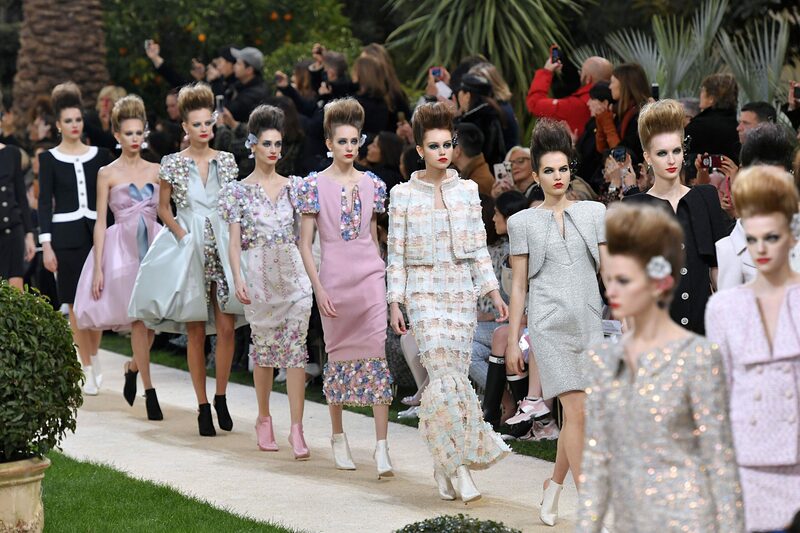 Along with the signature Chanel touches such as trim tweed suits and kissable red lips, we saw a vast array of ornamented flower bouquet motifs, illuminating all the looks made a clear statement in the show, highlighting the charm that underlies beauty. Natural, flowing dresses, balloon sleeves, princess-like bodices, full embroidered skirts, and lavish gowns exposed ravishing artistry. Flowers masquerade as hand-painted feathers in an array of soft tones chosen from a pastel palette. Romantic strips of fabric were gracefully sewn together and decorated with preserved dried flowers, creating a remarkable aurora in the Chanel-like manner that one has come to expect from the divine designer.